"These were one of many obscure Swiss symphonic progressives, typical of such Teutonic styled bands who originated in the mid to late-1970's. 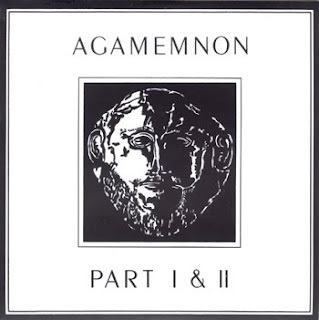 Derivative, yet also quite inventive, Agamemnon had a distinctly Pink Floyd type cosmic symphonic edge, akin to earlier albums by German bands like Eloy, Pancake, Jane, or more so, often close to Faithful Breath's similarly otherworldly debut album FADING BEAUTY. The Gnosis 2000 website gives this album a higher rating than Pink Floyd's "The Wall"! Thanks! Love this album but the two tracks always seem much too short. "The Gnosis 2000 website gives this album a higher rating than Pink Floyd's "The Wall"!" That is not too hard to understand. This is just a bloody good record. Looking forward to listening. Thanks! Hello Marc - hope things are going well for you! Hi Gabriel this blog is long dead, that link is 6 years old! I'm pretty sure I still have the files though, if you will email me at garcolga@yahoo.com I will do my best to upload them for you and I'll send you the links.